Birth 2 Sep 1731 Lexington, Middlesex Co., Mass. 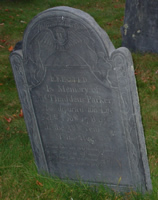 Died 16 Feb 1789 Lexington, Middlesex Co., Mass. Buried Lexington Burial Ground, Lexington, Middlesex Co., Mass. Mother ANNA STONE, b. 27 Nov 1694, Lexington, Middlesex Co., Mass.